New homes sales unexpectedly fell 3.6 percent in September to a seasonally adjusted annual rate of 402,000, the U.S. Commerce Department announced Wednesday, as the end of the $8,000 federal tax credit for first-time home buyers neared. Economists surveyed by Bloomberg had expected September new home sales to register a 440,000 annualized rate. Also, August's new home sales were revised lower to a 417,000 annual rate from the previously announced total of 429,000; new home sales totaled 413,000 in July, and 399,000 in June. In addition, the median sales price of a new house in September fell 9.1 percent on a year-over-year basis to $204,800. However, that median price is up 2.5 percent in the past month. There was one qualified bright spot in the September new home sales data: Inventories did not rise in September, as builders maintained an inventory of 251,000 units, or a 7.5-month supply at the current sales pace, the same as in August. Inventories totaled a 7.7-month supply in July and an 8.4-month supply in June. A healthy, normal new home sale market typically has a three- to five-month supply of homes on the market. New home sales are down 7.8 percent in the past year, but that's nevertheless an improvement over the more than 20 percent year-over-year decline recorded earlier in 2009. By region, new home sales in September surged 24 percent in the Midwest, were unchanged in the Northeast, fell 10 percent in the South, and declined 11 percent in the West. Investors should follow the new homes sales statistic because, historically, increases in home sales are strongly correlated with increased demand and an economic expansion. That's because housing activity does not operate in a vacuum. When new homes are sold, homeowners tend to buy durable goods and big-ticket items to furnish them: appliances, furniture, home supplies. And an uptrend in those areas is good news for the economy and a bullish indicator for U.S. stock markets. 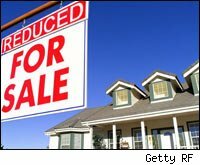 However, government statisticians also caution that the new home sales statistic contains a margin of error and is subject to revisions. Further, economists note that it typically takes three to five months to detect a trend, so investors should not read too much into data from one month. Analysis: The September new home sales stat was, without question, disappointing. But investors should note that one month does make a trend. However, if new home sales continue to decline, that would be a sign that the home sales increases in previous months were driven more by the federal government's $8,000 first-time homebuyer tax credit than by pent-up demand among eager prospective home buyers. The program expires Nov. 30, but Congress will probably extend the credit in some form through the end of 2010. This year's new and existing home sales data suggests the housing sector may need the added demand that the credit provides to sustain its rebound. On the bright side, inventories did not rise: That suggests builders remain very cautious about adding new supply, which is understandable given the housing sector's headwinds (high unemployment, rigorous mortgage approval requirements). Inventories are still high, but they appear to have peaked. Also, median home prices show signs of stabilizing. In sum, the new home sector data indicates a housing sector that's stabilizing, albeit with mild, inching-forward demand.